Nick and Iris Van Gruisen undertake a pioneering expedition on the upper reaches of the legendary Mekong River, a world of stunning scenery, charmingly unspoilt villages and pristine jungle. We travel aboard the RV Sabaidee Pandaw, a traditional but comfortable shallow draught river vessel with just 14 cabins, chartered exclusively for a 14-night cruise. We begin our journey in Kunming in China’s Yunnan Province before flying to Jinghong, where the majority of the population is made up of ethnic minorities. From here we will wind our way south on a thrilling voyage of discovery through the Golden Triangle where Thailand, Myanmar and Laos meet. We stop for two nights in Luang Prabang, the former capital and the jewel of Laos with its dazzling wood carved monasteries and ancient Buddhist traditions before continuing our cruise downstream and disembarking in the old French capital of Vientiane. Although this will be Pandaw’s third season on the Upper Mekong, the voyage will have an exploratory feel to it and a degree of flexibility and perspective may be required. There is also an optional post-tour extension offering the chance to explore Asia’s most magnificent archaeological remains – the Khmer Temples of Angkor in Cambodia – built between the 7th and 11th centuries comprising some 70 ruins and covering an area of 200 square miles. Raised in Northumberland, in the 1970s Nick spent five years as a professional guide in Botswana and southern Africa. He then joined the Tiger Mountain group, pioneering cultural, trekking and wildlife holidays throughout the Indian subcontinent. He founded Worldwide Journeys and Expeditions in 1991, from which The Ultimate Travel Company emerged in 1998. His wife Iris was born in Northern Rhodesia (now Zambia), where she lived for a few years before moving to Papua New Guinea. In the 1980s, she too joined Tiger Mountain to work at their flagship lodge, Tiger Tops, in Nepal’s Royal Chitwan National Park. As well as co-leading trips with Nick, she has taken trekking groups on expeditions to Kilimanjaro, the High Atlas, Ethiopia’s Simien Mountains and the Himalaya. Day 1: Depart London Heathrow on Thai Airways via Bangkok (suggested flights have not been included in cost of the tour).Depart London Heathrow on Thai Airways via Bangkok (suggested flights have not been included in cost of the tour). Day 2: Morning arrival in Kunming. Transfer to the five-star Crown Plaza Hotel where one night is spent. Afternoon visit to the beautiful Green Lake Park. Dinner at the hotel. Day 3: Full day visit to the incredible Stone Forest with its enormous limestone formations. Yiliang Roast Duck lunch. Transfer to the airport for a flight to Jinghong. Board the RV Sabaidee Pandaw. Moor overnight in Jinghong Port.In the event that the water is too low it will be necessary to stay at the InterContinental or similar for two nights in order to complete the Yunnan sightseeing and then join ship by speedboat transfer from Jinghong to a position as close to the Chinese/Lao border as the ship can safely reach. Day 4: Visit the fascinating Tropical Plant Institute, a vast garden with over 13,000 plant species and 35 exhibits. Continue to Manting Park, dating back 1,300 years and previously a Dai Imperial Garden. Evening cultural show at the Maxmumbani Theatre by acrobatic dancers from 38 different ethnic groups. Moor overnight in Jinghong Port. Cruise the Mekong in China with magnificent scenery of dramatic, scenic hillsides and cliffs. Arrive at Guan Lei Port, take a walking tour and pass immigration. You are now on the Mekong in Laos. Sail downstream on the Upper Mekong with lush jungle scenery of Laos on the left and Myanmar on the right. Arrive at Ban Na Kor (Sob Luoy Port) and continue to a remote sand bank to moor for the night. Canapés and cocktails on the sandbank. Day 7: Arrive Chiang Saen, Thailand. After lunch, afternoon excursion by coach to the Golden Triangle area named due to the meeting of Myanmar, Laos and Thailand, which gained notoriety in the 1920s as one of the world’s most prolific opium producers. Visit the Opium Museum. Day 8: Pass through the immigration formalities at the Thai/Lao border and rejoin the Pandaw. 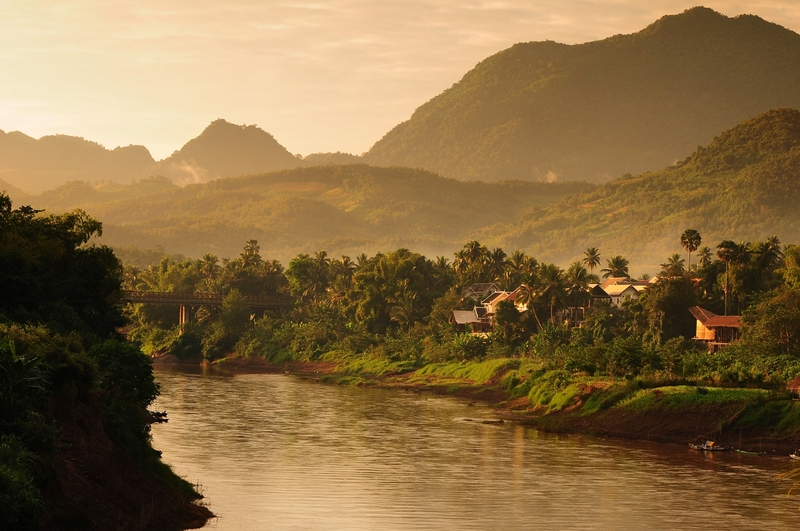 Set sail downstream on the beautiful Upper Mekong River. After lunch, if time allows, enjoy sightseeing on foot in a Laos jungle village. Morning walking tour of the local trading town of Pak Beng. Continue cruising downstream to Pak Ou, transfer to a local boat and enter the Nam Ou River to visit the extraordinary Pak Ou Buddha Caves. Admire the spectacular limestone cliff faces in the Buddhist sanctuary. Visit Pak Ou Cave Elephant Camp for retired working elephants. Day 10: Early morning arrival in Luang Prabang. Morning tour by tuk tuk of the ancient city of Luang Prabang with its many Buddhist temples and an interesting former royal palace. Visit Wat Xieng Thong Temple and Ock Pop Tock weaving village. Afternoon at leisure. Option to visit the buzzing night market or Mount Phousi at sunset. Dinner at Elephant Restaurant. Moor overnight in Luang Prabang. Day 11: Early morning walking tour to observe the morning alms offering to the local monks. Morning visit to the National Museum and Wat Mai Temple, once the residence of the head of Laotian Buddhism. Lunch at 3 Nagas Restaurant. Traditional dance performance on board. Moor overnight in Luang Prabang. Day 12: Morning tour by coach to see the deep jungle pools at the Khuang Si Waterfall and to visit the teak forest trails and butterfly farm. After lunch, enjoy a cooking demonstration on board and wonderful scenic cruising on the mighty Mekong River. Day 13: Pass through the Mekong water control lock at Xayaburi Hydro Electric Power Plant (itself an interesting and perhaps controversial tourist attraction). Late afternoon walking tour of a local village at Ban Park Bor where two local minority groups live together, the Lao Low Land and the Khamo peoples. Day 14: Morning visit to Ban Pak Huoang, an interesting local village on the Thai/Lao border. Continue to Pak Sao for an excursion to a plantation village and meet the local people. Day 15: Pass through a dramatic landscape of jungle and mountain where the river flows, fast and wild, and amazing rock formations straddle the river banks. Enter the cultivated plains of Vientiane province. Arrive mid-afternoon in Vientiane to moor overnight. Opportunity for independent exploration of this delightful, French influenced city. Day 16: Morning tour of Vientiane, including visits to Sisaket Temple, the President’s Hall, Wat Prakeo Temple and the Phatouxay Monument. Opportunity for independent exploration enjoying the many cafes and bistros in this charming little corner of L’Indochine. Farewell cocktails. Disembark in Vientiane. Transfer to the Lao Plaza Hotel where day-use rooms will be provided. Lunch under own arrangements. Afternoon at leisure. Transfer to the airport. Depart Vientiane in the evening on Thai Airways via Bangkok (not included in the cost of the tour). Arrive London Heathrow early morning. Emily specialises in organising escorted tours.